The tiny marks on the edges of the glass top are from pincers that lifted the glass before it was entirely cold. 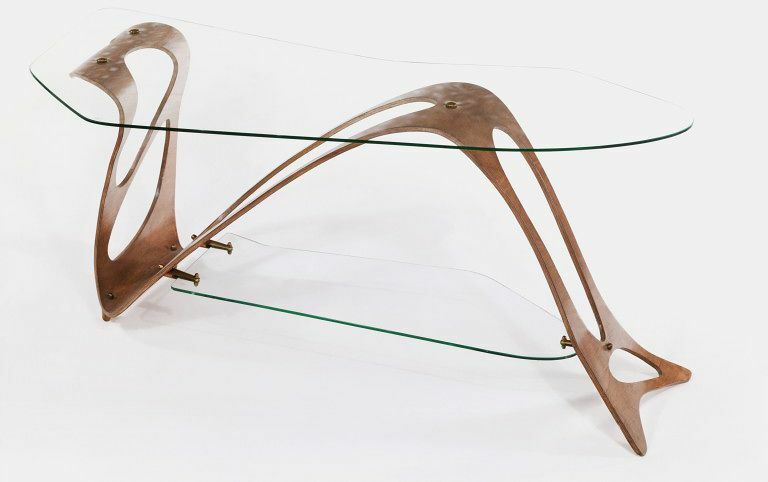 Although it is functional, this table looks like a piece of sculpture. Its undulating curves were inspired by the work of Surrealist artists, in particular Jan Arp's flowing lines and biomorphic shapes. The shape of the table top was based on the outlines of a woman's torso. Mollino had traced it from a drawing by the Italian Surrealist Leonor Fini (1908-1996). In 1950 the table was included in a major exhibition of Italian design called Italy at Work: Her Renaissance in Design Today. The Italian government sent this travelling exhibition around America. 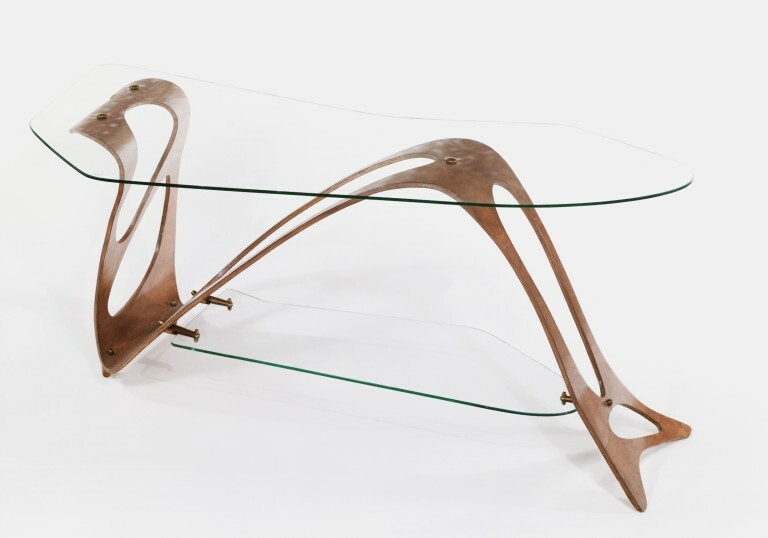 Low tea table of bent plywood with a glass top and shelf. The sheet of plywood that forms the base has been bent into a series of curves and pierced with five irregular, curved cutouts. The glass top which is fixed to the plywood base with brass fasteners, is also of irregular shape and has curved edges. The shelf is shorter and narrower than the top, but has a similar curved shape. The table is further supported at one end by two small brass feet which are fixed to the plywood base. According to Stephen N. Cristiea the table is one of only three examples known. Jervis, Simon, 'Echoes Over Two Centuries. Two newly acquired Italian tables at the V&A'. Country Life 6 June 1985, pp. 1586-1590. Mollino was an engineer and architect whose many passions included racing cars, photography and women. This table is perhaps his most famous furniture design. Its glass top followed the outline shape of a woman’s back in a drawing by the Surrealist artist Léonor Fini.